THINGS EVERY GARDEN NEEDS WHICH CAN BE A BUSINESS FOR YOU. Garden Accessories! GARDEN LIGHTING a great biz for a handy inventor type. 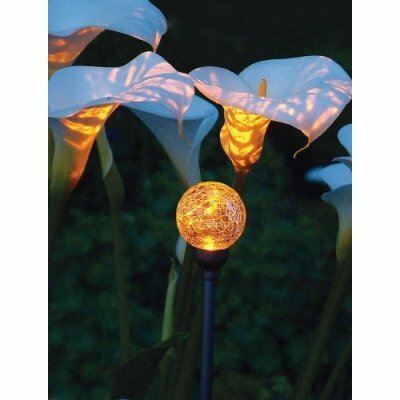 MAKE SOLAR LIGHTS like the sphere above which lights up some huge calla lillies. When they are no longer blooming, move the sphere to a MAGUEY CACTUS! Supplies: Molding compound and sphere Devon Clear Two Component Epoxy (from your hardware store) or get these fellows to sell you their products, "RESIN DEALERS"
Beautiful sights to inspire you. CHECK OUT THE Light-up LILLY, sunflower. (above) That's a great idea. you can wire up your own, use different objects. FIRST THE SPOOLS. Over where I go for chinese food, I see these SPOOLS left in the parking lot near the trash dumpster, one a week. Have no idea why. 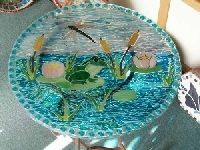 and sells them for 500$ I don't have a digital camera to photograph her work, but it's very LATINO, being good Mexican tile! These pictures that I found online don't have the zip that Anamaria's do. 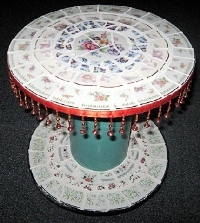 As for finding all that broken china? Your pals all start collecting it for you the second you inform them of your need. In CALIFORNIA, we have quakes regularly. You should see the trash barrels after a quake! Bring tears to your eyes. CHINA GALORE! 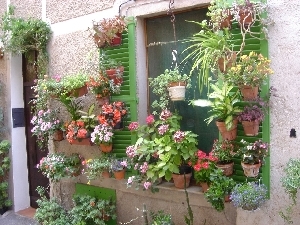 WALLS full of hanging plants. Water with a hose, pointed upward. 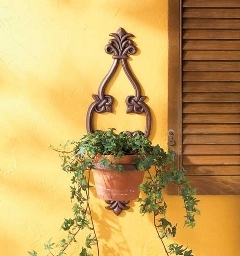 HANGING PLANTS require their hangers to be made of iron DRILLED into wall. Be inspired! COPPER objects? From rosy red to a final VERDIGRIS? You could take a plaster statue and paint it to look like verdigris copper. You'd have to PING it with your knuckle to realize it wasn't metal if you do it right.